This rare complete printing of the Constitution appeared on the first day it was publicly available, Wednesday, September 19, 1787. That same morning, the Constitution was published by four other papers, the Pennsylvania Packet, and Daily Advertiser, Pennsylvania Journal, Pennsylvania Gazette and Freeman’s Journal. 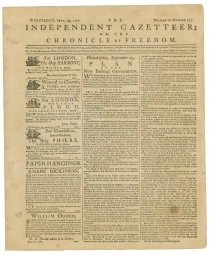 The Independent Gazetteer is unique, in that it is the only one of the five first-day printings whose type was evidently not used to print another, stand-alone edition. [U.S. CONSTITUTION]. Newspaper. 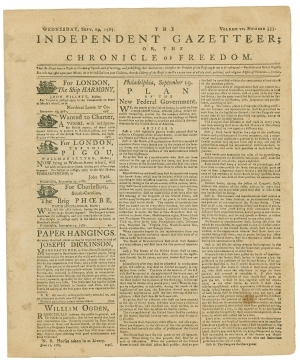 The Independent Gazetteer, or, the Chronicle of Freedom. Philadelphia: Eleazer Oswald, September 19, 1787. 4 pp. 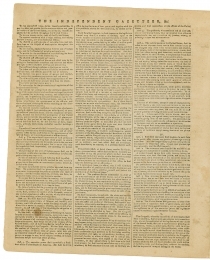 This issue of The Independent Gazetteer and Chronicle of Freedom, a daily Anti-Federalist newspaper, prints the “Plan of the New Federal Government” in full, followed by the Federal Convention’s resolution submitting the Constitution to Congress, and the accompanying transmittal letter. All three are signed in type by George Washington, as president of the Convention. The Constitution was approved by the Convention on Monday, September 17. 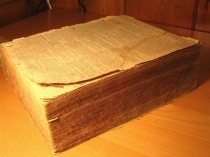 The text of the official version was set that evening, and a very limited number were printed for the use of the delegates. After being drafted in complete secrecy, the Constitution was first made public on the morning of Tuesday, September 18, when it was read before the Pennsylvania General Assembly. The next morning, Wednesday, September 19, the five newspapers mentioned above all published the Constitution. 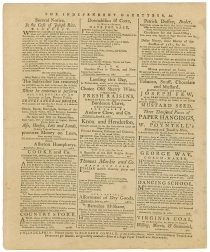 It is often assumed that the Pennsylvania Packet was the first public printing, as the publishers, Dunlap and Claypoole, were the official printers to the Constitutional Convention. In fact, there is no evidence that the Packet actually was published first, or appeared on the streets of Philadelphia that day any earlier than its four rivals. All five are considered first editions, with surviving copies of the Packet the most common. The dissemination of the Constitution in newspapers is of considerable interest and importance as it was through this medium that most Americans became familiar with the new form of government proposed by the Convention. One careful researcher, Leonard Rapport of the National Archives, has identified four Philadelphia newspapers which also carried the text of the Constitution on the same day (this was, after all, news of the highest importance), and one, the Philadelphia Evening Chronicle, which may hypothetically, have carried the text in an issue dated 18 September (“Printing the Constitution,” pp. 69-90). But, to date, no copy of the Evening Chronicle of that date is known to be extant (see Rapport’s other article, “Newspaper Printings of the Constitution”). The Pennsylvania Packet printing has been accorded primacy for two principal reasons. First, the Packet was printed by John Dunlap and David C. Claypoole, official printers to the Convention itself. Together as partners, or separately (Claypoole may originally have been a junior partner), they had printed nearly everything issued by Congress since 1775, including the 1776 Declaration of Independence. Second, with the exception of the Constitution’s six-line preamble (“We the people…”), the text is entirely printed from the same setting of type used for the official Congressional printing. 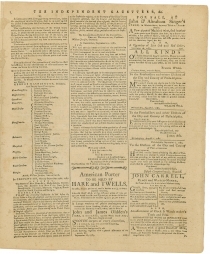 As Rapport notes, the 5,000 words of the Constitution represented “nearly one man-day of composition time” for the printer, so, sensibly, to make use of the wider margins of the Packet’s larger sheets, they reset the preamble in large type, with a large capital “W” below the masthead and simply reimposed the rest of their standing type to fit onto the paper’s four larger-size pages. The case might be summed up by emphasizing that the present Pennsylvania Packet text of the Constitution was struck from the identical setting of lead type that had printed the sheets of the official Congressional printings, sheets that Jacob Shallus, calligrapher, used when he copied onto parchment the engrossed document to which the delegates signed their names. “By October 6, only twenty days after the Federal Convention, at least fifty-five of the approximately eighty newspapers of the period had printed the...Constitution.” (Rapport, “Printing the Constitution,” p.89). With the text of the Constitution before the people, thanks to a free press, the great debate on its ratification would begin, a debate which continued until ratification by the original thirteen states was completed in 1790, and culminated in 1791, by the adoption of the Bill of Rights. Despite the tremendous changes, since 1787, in the nation and the people governed by the Constitution, Bernstein meaningfully notes, “the evolution of American politics and society continues to be shaped by the Constitution and by the principles and doctrines built into it by the men who drafted it. That the Constitution has worked as well as it has is a tribute to its flexibility and to the foresight of those who created it. That it may still be defective or capable of improvement is a challenge to us to equal the courage, imagination, and versatility of the Revolutionary generation of Americans” (Are We To Be A Nation?, p.272). Leonard Rapport. “Printing the Constitution: The Convention and Newspaper Imprints, August – November 1787” in Prologue: The Journal of the National Archives. Vol. 2 No. 2, Fall 1970. David Brion Davis & Steven Mintz. The Boisterous Sea of Liberty (New York: Oxford University Press, 1998). Bowen, Catherine Drinker. The Story of the Constitutional Convention: May to September 1787 (Boston: Little, Brown & Co., 1986). Richard Beeman, Stephen Botein & Edward C. Carter II, eds. Beyond Confederation: Origins of the Constitution and American National Identity (Chapel Hill: University of North Carolina Press, 1987). Max Farrand. The Records of the Federal Convention of 1787 (New Haven: Yale University Press, 1966). Clinton Rossiter. 1787: The Grand Convention (New York: W.W. Norton & Company, 1987).